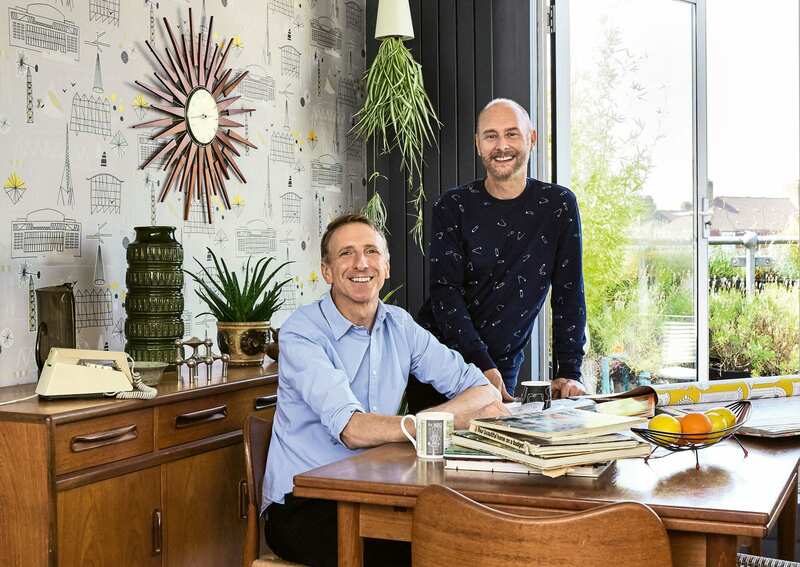 Our love for the new book and a questions time with Mini Moderns founders, Keith and Mark. 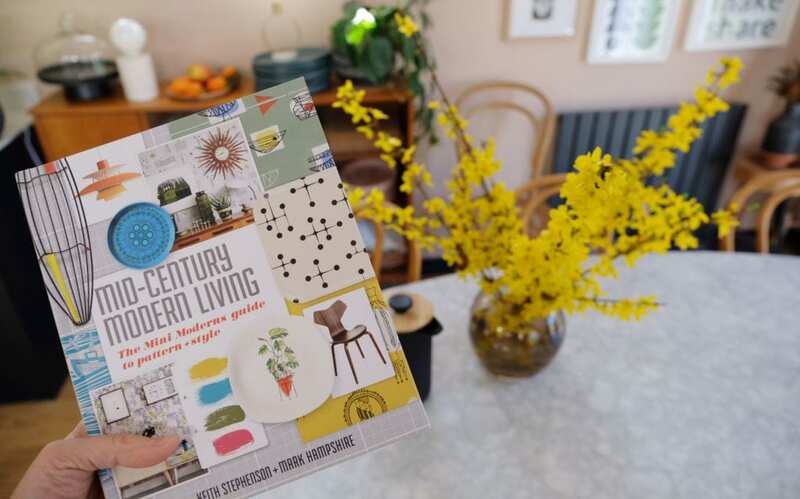 We’ve always loved the mid-century style and we were delighted to receive a copy of Mini Modern’s new book ‘Mid Century Modern Living’ in the post this week. From teak furniture to German pottery, we’ve owned lots of mid-century style items between us. We’ve coveted Arne Jacobsen’s Egg Chair and obsessed with Eames bird and we’ve always enjoyed the modern twist the Mini Moderns has inspired us with since we started following them a few years ago. With mid-century, you can admire it from afar for its shapes, colours and materials, or you can get really into it and learn all the chairs and lights. 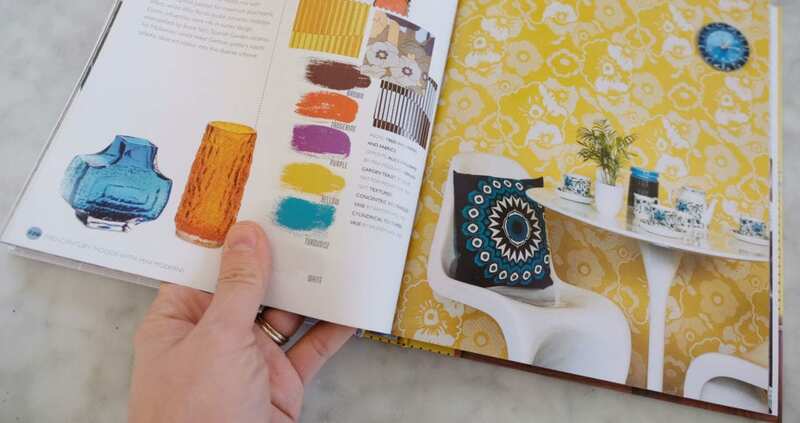 The new Mini Moderns’ book helps you to bridge the gap between appreciation and subject expert. Written in a way that’s great for the novice, but will also be appreciated by an expert, the book is a great read and we’d highly recommend picking up a copy. 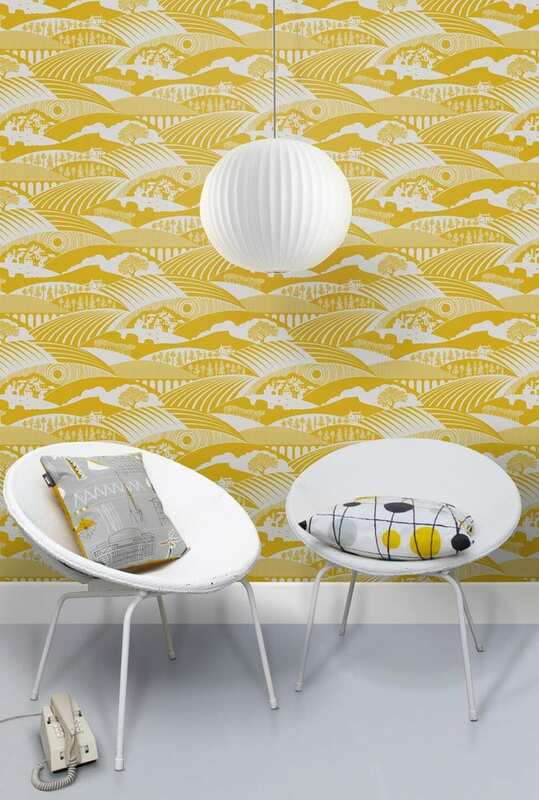 Mini Moderns was founded by Keith Stephenson and Mark Hampshire who met whilst working at a design agency. Their shared passion for mid-century inspired them to break off on their own, giving them the flexibility to pick work that inspired them and make time for a broader range of projects. The pair won a competition to design the wallpaper for a mid-century inspired London Showroom and the publicity gave them the boost they needed to start Mini Moderns. The book is full of lovely stories about their journey and their own obsessions for mid-century pottery, clocks, furniture, pattern and even music. What is really striking about the new book is the imagery. Lots of images have been shot from Mini Moderns sets and projects and there’s a good mix of well-sourced vintage images too. Designed in a mid-century palette, it’s a real feast for your eyes! What we really love about Mini Moderns is how they combine modern design with the influences of the mid-century style. Their prints and patterns are really beautiful and would fit into any modern home. We were delighted that Keith and Mark agreed to answer a few questions about the book and of course Mini Moderns. You’ve clearly always loved the mid century style, do you remember what your first obsession items were? The things you had to have? Our love of mid-century began in our teens. Strangely enough, it didn’t start specifically with interiors. Ours was a more gradual process of discovery, taking in mid-century influenced graphics and pattern through books and album covers, and buying second-hand clothes or making our own garments from 1950s curtains. We also loved classic films and cult TV shows from the 50s and 60s – and we started to take in the stylish domestic interiors they portrayed. The concept of open-plan living that we saw on the small screen – all room dividing shelving and spindly legged furniture – was something we both aspired to having in later life, so, whilst searching for 1950s shirts and fabric, we both started to hunt out small furnishing pieces like kidney side tables and ceramics at jumble sales and second hand shops. The ultimate mid-century must-have was the sideboard – but since our twenties were spent moving from one rented London flat to another, keeping possessions as portable as possible, the sideboard remained on the wish-list until home ownership was on the cards. 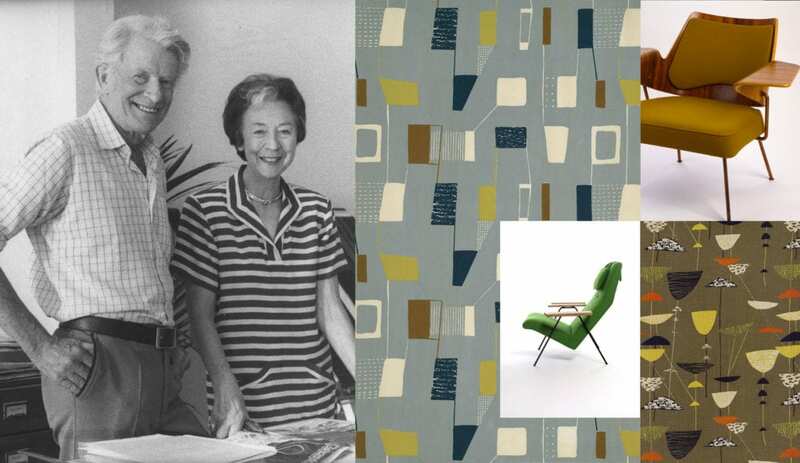 The designers we both first became aware of on our journey of mid-century discovery were Robin and Lucienne Day – largely due to our interest in the 1951 Festival of Britain. Obviously, this was quite a labour of love in those pre-internet days. 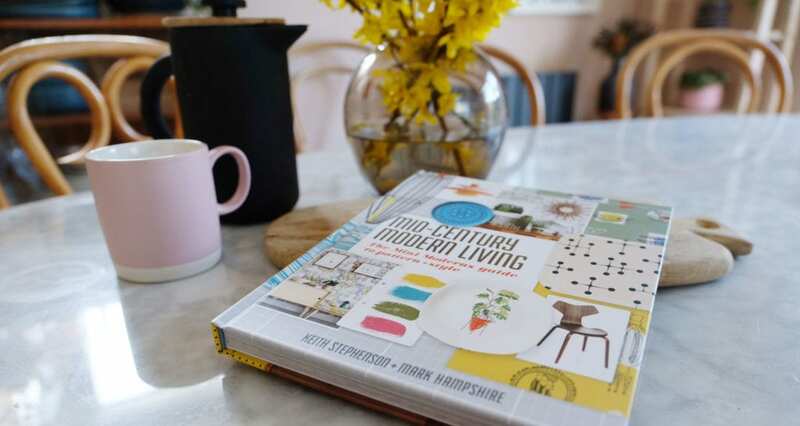 The fact that we still live with their designs in our home is testament to the enduring nature of mid-century design, and so we would say that the designers of that era continue to be our main source of inspiration. We continue to make discoveries too. Whilst we’d always admired the work of Le Corbusier, a recent stay in the Unité d’Habitation in Marseille has rekindled our interest in brutalism. Similarly, our passion for Gio Ponti has become even stronger since visiting the current exhibition of his work – Tutto Ponti at the Musée des Arts Décoratifs, Paris. In terms of contemporary designers, we are inspired by the work of Italian interior architects Marcante Testa – to our mind they respect their mid-century influences whilst creating beautifully contemporary interiors. If you had to pick one, which would be your favourite iconic mid century chair? 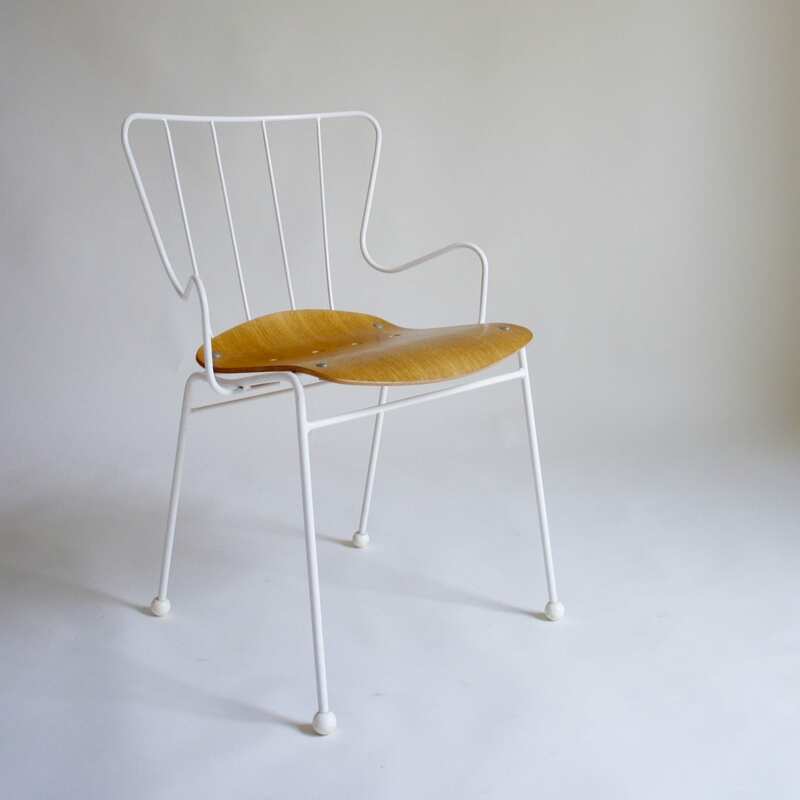 We love the Earnest Race Antelope chair due to its 1951 Festival of Britain associations – it was selected as the chair for the Festival site, with Gordon Russell, chair of the selection judges, believing Race’s designs ‘miles ahead’ of his contemporaries. The simple moulded plywood seat was painted in the Festival colours of yellow, blue, red or grey. What’s your favourite piece of mid century furniture that you own? Our String shelving system. 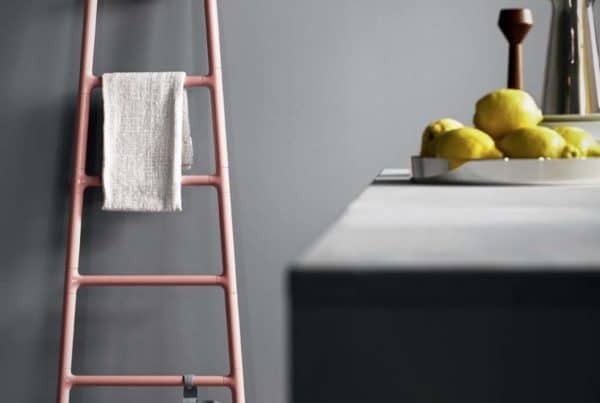 It’s a design classic that is infinitely practical. 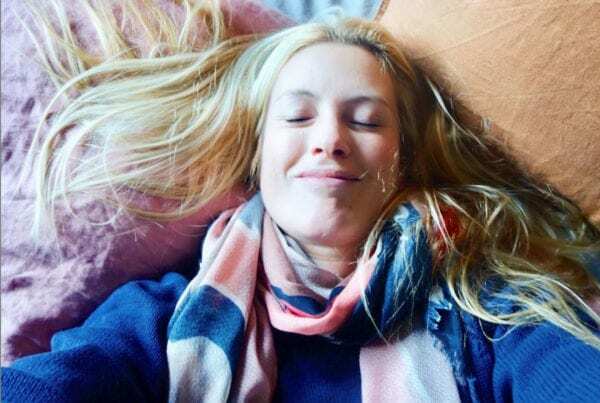 Even though it seemed a bit of an extravagant investment to start with, we made a decision to start buying it when we moved into our live/work space 16 years ago and it has grown and adapted to suit our needs over the years. That also makes it totally sustainable because it will always work for us, so we’ll never need to replace it. We both coincidentally owned 1980s Panasonic SG series music systems in our teens and neither of us can bear to part with them. We think they look cool but nobody else ever does. We have always listened to our vinyl collection – even before vinyl became ‘a thing’ again. The result is that we have about half a dozen rubbish looking but functional turntables hidden away in cupboards. We’ve never quite got round to buying the ideal reconditioned turntable that would look good on display. Your wallpapers are truly beautiful, do you have favourites from your range? As a designer your latest collection is always your favourite? It’s hard not to love your most recent designs the most, because the process from design to production is all-consuming, so for at least 6 months after they launch, they are the designs that occupy your thoughts. Plus, when designing a new collection you are channeling your most recent creative obsessions, so these designs are naturally very important to you. Our current favourite from our 2019 Culture! Collection is Vessel, which features illustrations of an eclectic array of vases and jugs, inspired by the Geffrye Museum’s diverse ceramics collection. Whilst that design is admittedly one of our latest, many of our designs are born out of our personal experiences, and so they stay in our hearts. That’s the case with our Moordale design, which features the Yorkshire moors and dales that surrounded us during our childhood. You’re so lucky to work in something you clearly love, what advice would you give to someone looking to take the plunge and do the same? On an emotional level, it’s important to be honest with yourself. You might love making ceramic pots because it offers you a creative outlet that’s different from your day job – but think long and hard about whether that would change once the creative outlet becomes your day job. The honest truth is that once you have to make money from your creativity, you will necessarily spend more time on marketing and logistics than on designing. On a practical level, if you’re really determined to take the plunge, keep your overheads down and your financial risk to a minimum. You might even want to introduce your new venture alongside your main source of income to try it out before you make the change. Your book is an absolute delight and a great reference for anyone who loves the style but perhaps is learning the ropes. How do you think your book might influence its readers? We hope that our book will inspire readers to explore the mid-century era and find the elements that chime with their personal style. That might be a specific era or a designer or a style of design. We always say that whilst mid-century design is our passion, we’re certainly not mid-century purists. We don’t live in a museum and we don’t expect others to either. 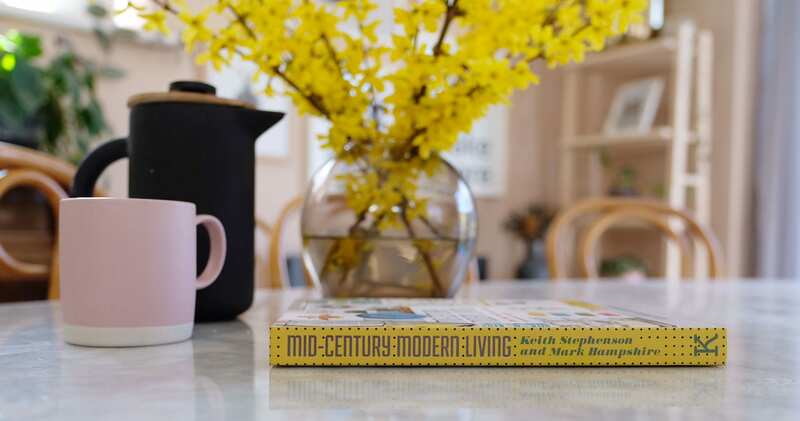 We hope readers of the book will take the optimism and exuberance of mid-century design and use it as a springboard to create contemporary schemes that work for modern life. Thank you so much to Keith and Mark. We are truly inspired!